To help you communicate about your events and surveys, CampusGroups allows you to share this information easily with your members while composing an email. Click on the 'Emails' menu and then on 'Compose Email'. Scroll down page to Section 5 to select the clickboxes you wish to include. 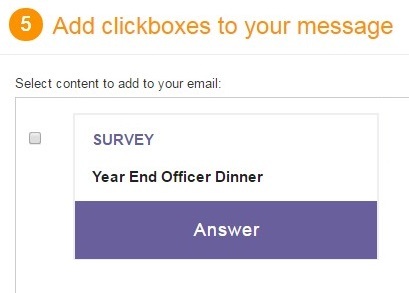 These clickboxes will be automatically generated at the bottom of your email. From there, students can register to your event or answer your survey.